Many of the samples we analyze are sent to us directly as essential oils. Sometimes, however, a customer wishes to compare plants before their extraction. He may also need a measure of oil yield so that he can plan ahead larger extractions. In these cases, we use two main extraction techniques, each with its advantages and disadvantages: hydrodiffusion extraction and Clevenger apparatus extraction. Both techniques apply to oils that are less dense than water (specific glassware is otherwise required). Figure 1. Hydrodiffusion extraction apparatus. Hydrodiffusion (figure 1) consists of extracting the essential oil with steam that circulates through the plant material. At laboratory scale, we bring a few liters of water to a boil, and steam rises in a column containing the more or less finely ground plant. The vapor phase is then directed to a condenser, and the liquid is collected in a graduated burette. Thanks to a bended connection at the base of the burette, the hydrosol flows to the left in the beaker, while the essential oil remains in the burette. After typically 2 h of extraction (calculated from the first condensed drop), we can measure the volume of oil recovered and calculate the yield from the mass of plant introduced. This technique has the advantage of allowing us to recover the hydrosol. It also allows us to perform extractions on larger quantities of plants. For example, in the picture above, we are extracting 1.25 kg of cow parsnip stems for a research project. This technique is quite similar to that typically used in industry, at a much smaller scale. However, the extraction may be less exhaustive with hydrodiffusion than with a Clevenger apparatus. Figure 2. Clevenger extraction apparatus. The Clevenger apparatus was named from its inventor, Joseph Franklin Clevenger, who published in 1928. A few models exist. The most common one (Figure 2) is a piece of specific glassware, as can be seen above the round bottom flask. The flask, of variable size, contains water which is boiled as well as the plant to be extracted. The steam rises in the assembly to a condenser (out of picture), and the condensate falls into the small burette on the right. Oil floats on the water, which for its part is gradually returned to the heated flask through the diagonal conduit. After 2 hours of extraction, the oil volume collected in the burette can be directly measured. Sometimes, the Clevenger apparatus gives higher yields than hydrodiffusion. Several factors can explain this phenomenon. In particular, the packing of the plant material in the hydrodiffusion column sometimes creates pockets that are poorly exposed to steam, and therefore not properly extracted. 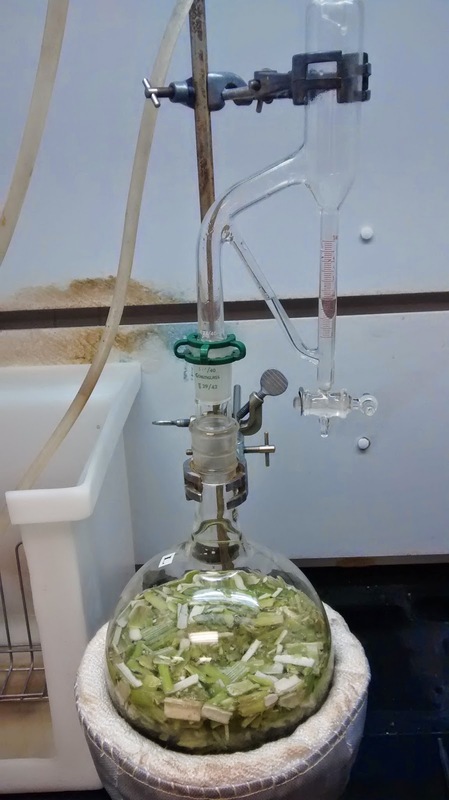 In addition, the Clevenger apparatus uses cohobation: the hydrosol is not recovered here, it is rather returned to the extractor. Therefore, compounds in solution in water are distilled again, and as water becomes saturated, these compounds begin to accumulate in the essential oil phase. The Clevenger apparatus is therefore considered to be the most representative of the "absolute" content in volatile compounds. On the other hand, this type of extraction is rather scarcely applied at large scale, and the yield is generally overestimated compared with what can be expected in an extraction plant. 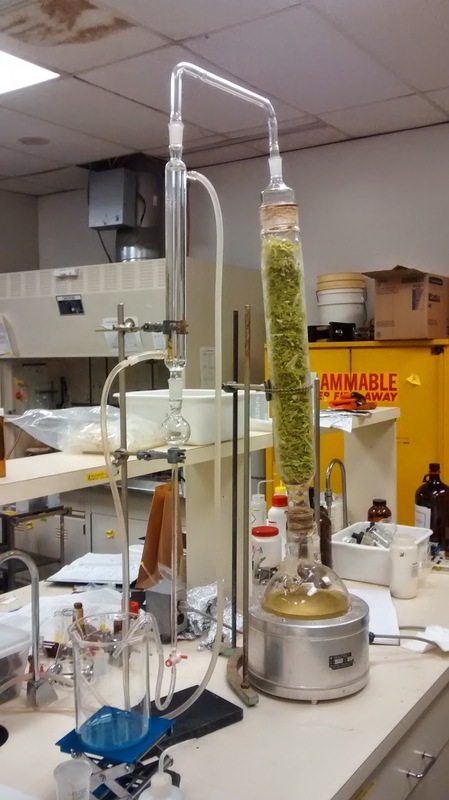 In addition, although we can change the size of the round bottom flask, we are much more limited for the amount of plant material that we can extract (here again for rods of cow parsnip, we are extracting 250 g). In short, the choice of method to use will depend on the objectives of the project and the estimated extraction capacities of the customer. Whether for one or the other of these methods, keep in mind that you can count on Laboratoire PhytoChemia should you need to estimate the essential oil yield of plant material without performing the extraction yourself.